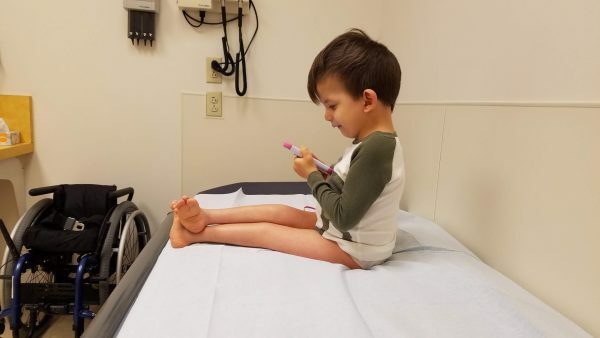 Daniel being brave about having his pants and socks off at the doctor office… and enjoying that he was given a cell phone loaded with preschooler games and music. He told me to go sit in the chair instead of beside him… boy still doesn’t know that I’m on his team. He’s strong! When we got Daniel home, we got him into an orthopedist within a couple months to discuss treatment. At that point, we decided that it was best to get his weight up, have time to get settled and learn some language. So this January we went back for a second evaluation and to discuss the treatment plan. The treatment plan hadn’t changed much, so I know roughly what to expect for this stage one of Daniel’s lifelong orthopedic care. So what’s the plan and what’s this about lifelong care? In reverse order: Daniel’s orthopedic consition (arthrogryposis) is not something that can be cured, but we can get his legs and feet in a more functional position than they are now. However, as he grows and uses his body, he will “relapse” and the club foot will curl under again and so forth. The more often he has surgery, the more stiff his joints will be for the rest of his life. Deciding what to do and when to do it is a flexible process and takes lots of factors into account. Everything from leave the foot curled under to muscle transfers, to joint restructuring, to serial casting and minor surgeries all the way to amputation and prosthetics. So that means that I only kind of know the treatment plan. I know what the most likely current plan is and it’s 6 or more weeks of casting from above the knees to his toes with weekly cast changes. These won’t be comfortable casts, because each time, the foot and knee are stretched a little further towards the nominal position and held there by the cast. After we see how far we can get with that, we’ll do whatever surgery seems like the best option at the time, based on how the casting went. We have to overlay Daniel’s mental health with all of this, since he has significant PTSD/fear/trust issues… which means physical therapy might be especially challenging or unsuccessful and which means that finding a provider with top notch bedside manner is imperative. The local doctor seems to know her stuff, but she and I and Daniel are not a good match. She is brisk and doesn’t connect with Daniel and doesn’t explain things in detail to me. Also, the hospital is not an efficient, well-run program (I love Shriners mission, but they can be poorly administrated.). I wanted to love it, but I just couldn’t imagine feeling peaceful and confident putting Daniel in their hands. So that means we’ve got two further consultations before we choose a provider to provide care… both now and in the years to come. Unfortunately for us, the doctors with the highest reputations are all on the east coast! Thankfully, they’re in network for insurance coverage, but there will be a lot of traveling and lodging expense along with figuring out how to provide care to our entire family since Jordan doesn’t travel. In April, Daniel and I will fly to see two different doctors… one on April 1 and one on April 24. (For those who are curious – Dr. Louise Reid Nichols at Nemours/Dupont Hospital and Dr. David Feldman at The Paley Institute.) I leave the day before and come home the day after. I should be plenty tired!!! Daniel in an airport and airplane for 6-10 hours. Wheeeeee. I’m glad to have this many decisions made and these appointments scheduled. I’m anticipating Daniel receiving treatment this summer? I’m not sure. Afterthought: There are so many therapies and treatments and appointments recommended, suggested, and expected by the myriad of providers that my children see. As the care coordinator for: myself, my children, and for my family as a unit – I optimize what we do. That means I decline a lot of therapies and appointments. I am managing the family’s health for a long ultra marathon. I cannot sprint, except for short periods, without our family’s health falling apart. That usually looks like individual’s needs getting neglected to the point of fallout – caused by meeting every expectation by a provider for a different individual. Sometimes it’s me that burns out. Sometimes it’s another one of the children. Regardless of who it is – it’s serious and it’s important that I prioritize, even when it means not meeting some peoples expectations of me. Sharing for my fellow over-achievers who are battling mom guilt! Thanks for keeping us up to date. Love you all.